Hoppin’ John is a classic Southern dish served on New Year’s Day. 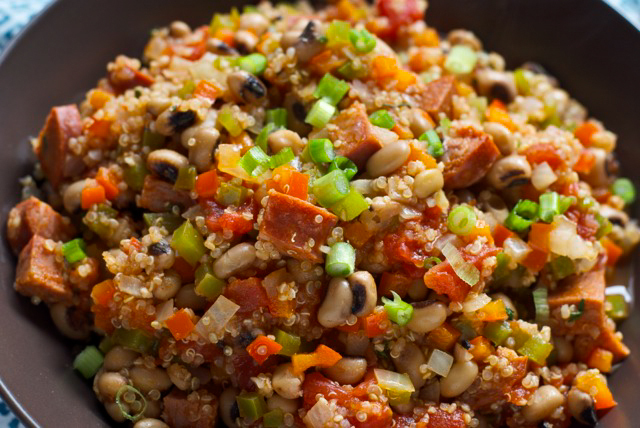 The black-eyed peas are supposed to bring you good luck in the coming year. It was shared with me by my good friend Pam Crooks, a Southern girl from North Carolina. Happy New Year and hope you have a great 2017! *You can also add chopped garlic, canned chopped tomatoes, chopped or frozen kale or collards if you desire. Add the veggies and brown. Add the ham hock and remaining ingredients except the rice and garnish. Bring to a boil, reduce heat and simmer for 45 minutes or until tender. You may need to add more water. Serve over the rice and sprinkle garnish over dish and enjoy!